After Confirming your Sale, Pick tickets are created from the individual sale workflow page. It represents a single intended shipment from your warehouse and may contain the order in it's entirety, or just part of the order. You can create as many pick tickets as you wish. For each Pick Ticket, a Delivery Note or Commercial Invoice PDF can be generated. You therefore may wish to create a pick ticket per physical box packed. For more information on Confirming Sales Orders, please see Manage the State of a Sales Order Knowledge Article. 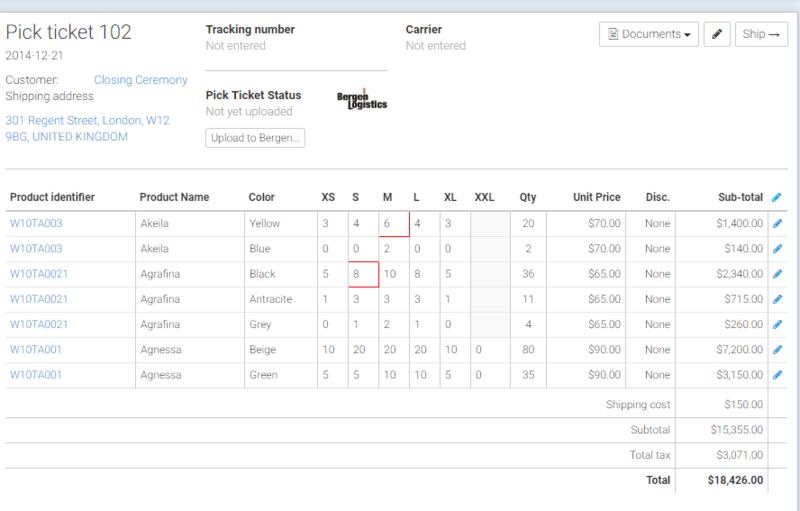 Navigate to your sales and select "Pick Ticket" from the "Create" drop-down above the Documents area on the top right. You'll notice that the dialog also shows you a set of "Remaining to pack" quantities. These quantities reflect the total remaining units that Stitchex expects you to pack for this sale. The value also takes cancellations into account (reducing the quantity required to ship). If stock is available, the pre-set quantities will correspond to the quantities shown as "Remaining to pack". Lower pre-set values indicate that you have a shortfall of stock to fulfill this order. The value present will be the maximum quantity that Stitchex thinks you can have present in stock and available to pack. Bear in mind that Stitchex takes into account quantities in other, existing pick tickets so it may be lower than the quantity showing as "in stock" under your inventory report. Check the line items you'd like to include in your shipment, adjust quantities if necessary, and click "Create pick ticket" to create the shipment. To edit individual line items, click on the "edit icon" (pencil) at the end of each row to modify the quantities. To Edit a Pick List (or Shipments), click on the edit icon (pencil, top right). From there you can change the Shipment/Pick Ticket Number, Shipping Cost, Dimensions, Net Weight, Gross Weight and Warehouse for your Shipment. Click Update Shipment when you are ready to save your changes. If you only know the Gross Weight or Net Weight in a particular measurement but need it displayed on the documents in another measurement, let Stitchex do the conversion for you. Enter the weight in pounds (lb), then select grams (g), kilograms (kg) or ounces (oz) from the drop down menu. Stitchex will automatically do the calculation for you! Also, see our Knowledge Articles on integration capabilities with Logistics providers that will automatically populate Tracking Number and Carrier fields for you. If you see a red boxes around certain quantities within the pick ticket, then you have insufficient inventory to ship that quantity. Hover only the quantity to see the current inventory level. 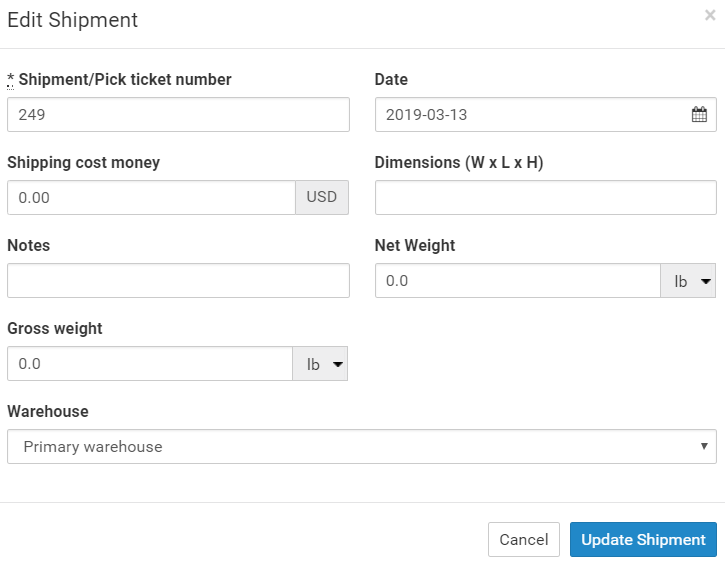 Converting your pick tickets to shipments can be done from the workflow page (via the "Ship →" button) or from the dedicated Pick & Pack interface. The dedicated pick & pack interface is a convenient place to manage multiple pick tickets that you've created without having to navigate between individual customer orders. 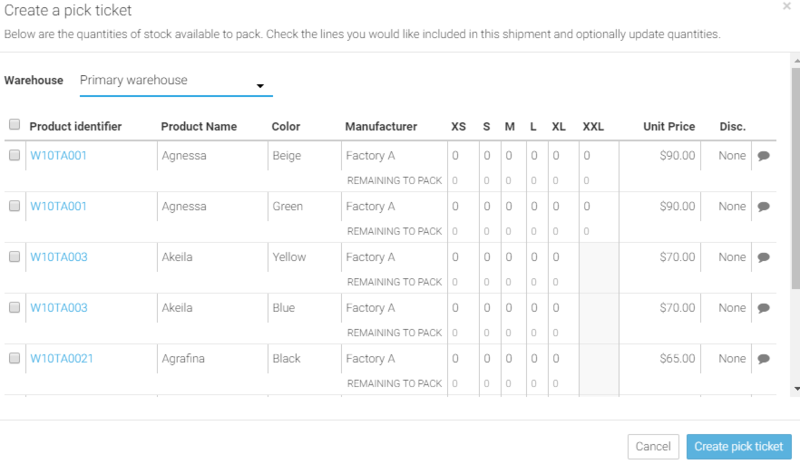 When you have certain products available for shipping, create pick tickets for each sale you wish to ship, then use the pick & pack interface to print packing lists, make any adjustments necessary, and ship convert the pick tickets to shipments, which correctly reduces inventory as you go. If you need to revert a shipment back to pick ticket, you can do so by clicking the "Unship ↩" link at the bottom corner of the shipment. Inventory will increase accordingly and you will be presented with the unshipped and editable pick ticket. Click the icon to bring up the edit shipment dialog. Enter a tracking number into the form.